This rubber stamp set contains a clever image of a Christmas tree featuring the first five items associated with 'The Twelve Days of Christmas'. Also included is a child's rocking horse, a Christmas angel, some holly and a robin. 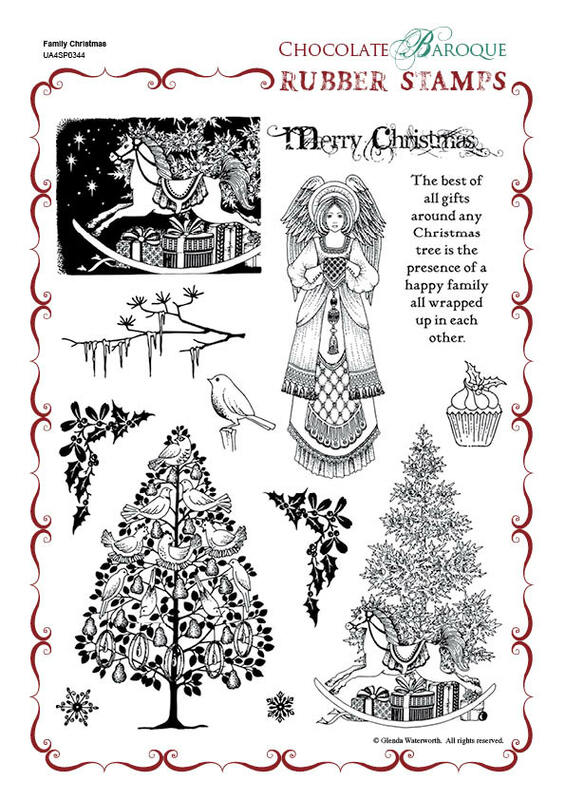 This beautiful series of stamps illustrate all areas of the festive season and can be used for a variety of different projects. I'm in love with this stamp set! Every image on it is superb and it stamps like a dream. Absolutely gorgeous. Two reasons: 1. the stamped images are stunning, amazing, outstanding! 2. I ordered the set on Monday and 2 days later, on Wednesday, I'm getting it inky here in Portugal. How's that for service?! I predict many hours of fun with this set.. I strongly recommend that you get one too! The online images of these stamps does not do them justice. Beautifully crafted, clear, precise and able to stand alone on the page.